The Cruise Terminal of Alexandria is first class, but way out of town. Either make private excursion arrangements in advance or opt for one of the cruise company's tours. Or...stay onboard...90 % of the passengers will leave early and return very late from their excursions to the pyramids and Cairo and you have the ship by yourself! The port itself is pretty buttoned down and you'll need your passport to exit. Egypt does require a visa, which is handled in advance onboard. 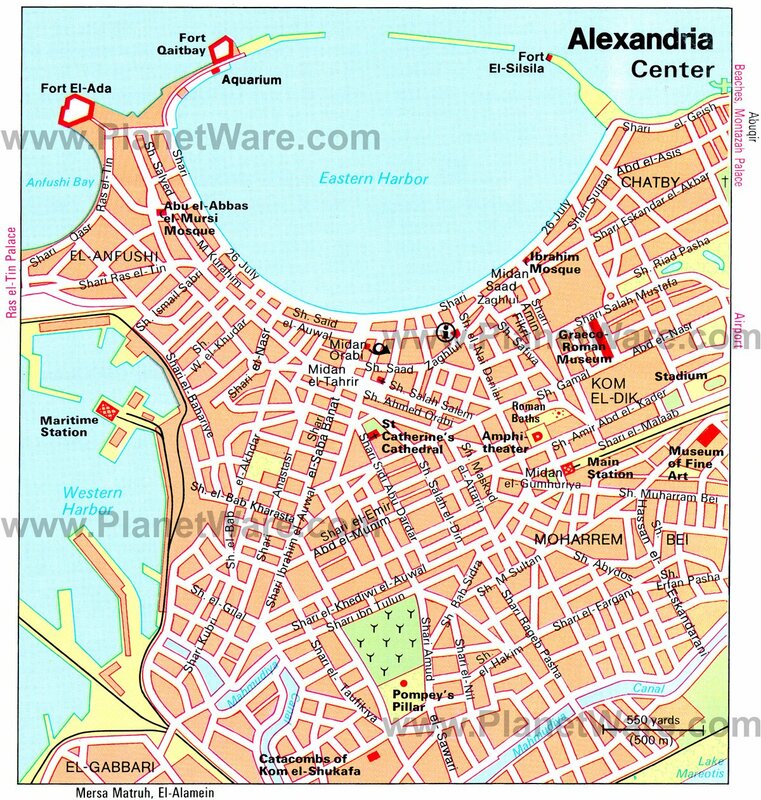 Established by Alexander the Great as early as 332 BC, Alexandria was once the greatest city of the ancient world and one of the three main centers of the Christian world. It lies on the Mediterranean Sea at the western edge of the River Nile delta, about 183 km (114 miles) northwest of Cairo. The city's impressive Graeco-Roman Museum houses some 40,000 relics, providing insight into the long religious history of the many civilizations of Alexandria. Other highlights include the Roman Amphitheater, the royal family's Montazah Palace and Fort Qait Bey, built upon the foundations of the destroyed Pharos Lighthouse, formerly one of the Seven Wonders of the World. Also, visit the Catacombs or Pompey's Pillar or take a stroll on the seafront boulevards, reflecting a more recent era. A taxi ride from the port to Corniche, the city's waterfront boulevard, costs 10 euros. The Corniche is a road that runs along the eastern harbor of Alexandria and is the perfect place for a waterfront stroll. There are several restaurants where you can enjoy freshly caught fish. There are no working meters in the taxis in Alexandria. A short trip, say from Midan Ramla to Misr Train Station, will cost E£5; from the city center to Fort Qaitbey E£5; from the city center to the Royal Jewellery Museum or Mahmoud Said Museum E£15; and from the city center to Montazah or Maamoura around E£25. Important: There are many companies offering excursions into Alexandria and Egypt, and in general are reliable. But your ship only will wait for late customers if they booked the ship's excursions. So be sure to have a cell phone with you (and the ship's telephone number!) just in case! Most of the tours to Cairo will try to sell you a Cartouche. Also Papyrus gifts are very popular. As most tours to Cairo end up at the Bazaar, before returning to Alexandria, you will have ample of time to do some shopping there. With all tours armed security will be on each bus. And often police escorts will be close to the bus caravan. Bus caravans of 50+ buses are not uncommon.